In this paper, we proposed a new hybrid system that combines an USV and the ROV. It is designed to overcome the cumulative navigation error and the battery problem for long time operation. The USV is connected to the underwater robot with a tether cable that enables GPS data transmission and stable power supply. In addition, by installing a winch system on the USV, it is possible to move and to retrieve the ROV for long distance travel and for depth control. The ROV equipped with underwater sensors which can acquire underwater image capture and undersea topography information and can transmit it to the land through the USV in real time was designed. Line-of-sight navigation and dynamic positioning algorithm were studied for the USV to perform autonomous navigation and keeping-position while ROV is doing underwater operations. Good performance of the USV was verified by simulation and real sea experiment using the developed hybrid USV and ROV. B. H. Jun, J. Y. Park, P. M. Lee, F. Y. Lee, and J.H. Oh, “Development and tank of an autonomous underwater vehicle 'ISiMI',” Journal of Ocean Engineering and Technology, vol. 21, no. 2, pp. 67-74, April 2007. A. Kukulya, A. Plueddemann, T. Austin, R. Stokey, M. Purcell, B. Allen, R. Littlefield, L. Freitag, P. Koski, E. Gallimore, J. Kemp, K. Newhall, and J. Pietro, “Under-ice operations with a REMUS-100 AUV in the arctic,” Autonomous Underwater Vehiciles(AUV), IEEE/OES, pp.1-8, September 2010. P. Mahecek, C. A. Kitts, and I. Mas, “Dynamic guarding of marine assets through cluster control of automated surface vessel fleets,” IEEE/ASME Transactions on Mechatronics, vol. 17, no. 1, pp.65-75, February 2012. S. P. Hong, J. W. Jeong, C. W. Lee, H. S. Lee, H. W. Choi, and I. H. Park, “A study on the environment of USV wireless communication,” Journal of Ocean Engineering and Technology, vol. 23, no. 2, pp. 53-57, April 2009. J.E. Manley, “Unmanned surface vehicles, 15 years of development,” Oceans 2008, IEEE, pp. 1-4, September 2008. D. Pearson, E. An, M. Dhanak, K. V. Ellenrieder, and P. Beaujean, “High-level fuzzy logic guidance system for an unmanned surface vehicle (USV) tasked to perform autonomous launch and recovery (ALR) of an autonomous underwater vehicle (AUV),” Autonomous Underwater Vehiciles, IEEE/OES, October 2014. R. J. Yan, S. Pang, H. B. Sun, and Y. J. Pang, “Development and missions of unmanned surface vehicle,” Journal of Marine Science and Application, vol. 9, no. 4, pp. 451-457, December 2010. Edoardo I. Sarda and Manhar R. Dhanak. 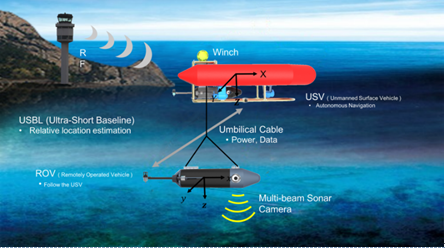 “A USV-Based automated launch and recovery system for AUVs,” IEEE Journal of Oceanic Engineering, vol. 42, no. 1, pp. 37-55, January 2017. M. Miranda II, “Mobile docking of REMUS-100 equipped with USBL-APS to an unmanned surface vehicle: A performance feasibility study,” Florida Atlantic University, Florida, 2014.